On June 5, 1968, Senator Robert F. Kennedy won California’s Democratic primary in his bid to become President of the United States. That night, after his victory speech at the Ambassador Hotel in Los Angeles, Kennedy was shot in the head and neck in what turned out to be a successful assassination attempt. He died the following day. In a famous photograph taken seconds after he was shot, Kennedy lies on the floor. A teenaged hotel busboy kneels beside him, cradling the Senator’s head. That busboy was Juan Romero, who came to the United States from Mexico as a child. At StoryCorps, Romero remembered the night of the assassination — and how he met Senator Kennedy the day before, when Romero helped deliver his room service. Top photo: Juan Romero at home in California holding a photo of himself and Senator Robert F. Kennedy that was taken the night Kennedy was assassinated. The photo he holds was taken by Boris Yaro of the Los Angeles Times. 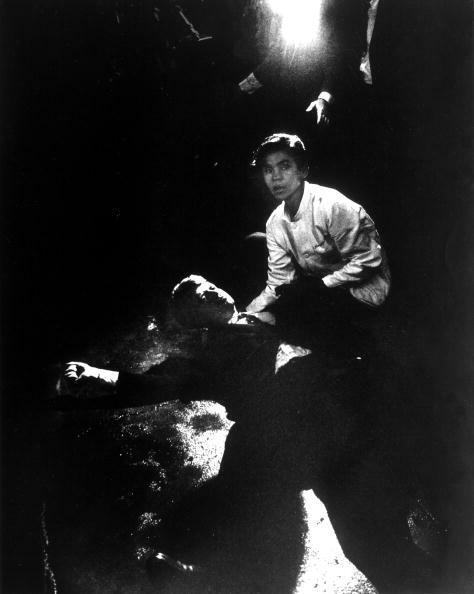 Bottom photo: Hotel busboy Juan Romero cradling Senator Robert F. Kennedy’s head after Kennedy was shot at the Ambassador Hotel in Los Angeles, California on June 5, 1968. Photo by Bill Eppridge/The LIFE Picture Collection/Getty Images. Originally aired June 1, 2018, on NPR’s Morning Edition. JR: They opened the door and the Senator was talking on the phone. He put down the phone and says, ’Come on in, boys.’ You could tell when he was looking at you that he’s not looking through you; he’s taking you into account. And I remember walking out of there like I was ten feet tall. The next day he had his victory speech, so they came down the service elevator, which is behind the kitchen. I remember extending my hand as far as I could and then I remember him shaking my hand. And as he let go, somebody shot him. I could feel a steady stream of blood coming through my fingers. I had a rosary in my shirt pocket and I took it out, thinking that he would need it a lot more than me. I wrapped it around his right hand, and then they wheeled him away. The next day, I decided to go to school. I didn’t want to think about it, but this woman was reading the newspaper. And you could see my picture in there, with the senator on the floor. She turned around and showed me the picture. She said, “This is you; isn’t it?” My photo was right on the front page. And, uh, I remember looking at my hands and there was dried blood in between my nails. It’s been a long fifty years and I still get emotional; uh, tears come out. But I went to visit his grave in 2010. I felt like I needed to ask Kennedy to forgive me for not being able to stop those bullets from harming him. And I felt like, you know, it would be a sign of respect to buy a suit. I’d never owned a suit in my life. And so when I wore the suit and I stood in front of his grave, I felt, uh, a little bit like that first day that I — that I met him. I felt important. I felt American. And I felt good.